As Barcelona and Real Madrid waged war in a blood-and-thunder El Clasico on Sunday, it might have been the Premier League's big guns who heard the message loudest of all. Having dominated the Champions League's latter stages over recent years, continental Europe could only look on in envy as the English sides threatened a monopoly on club football's grandest trophy. But if Barca's victory in last season's final against Manchester United in Rome in May stopped that bandwagon in its tracks, events from the Camp Nou might suggest it is on the way to being derailed completely. Forget the Barcelona 1-0 Real Madrid scoreline for just a moment - this was a game of exquisite, irresistible quality between two teams who are equally desperate to dominate the game for the next half a decade. It was billed as the richest contest in the sport's history: Real, bolstered by the subjects of their summer spending spree, sent out a starting XI that cost £256m with a further £70m and Raul on the bench; Barca's team - with record £60m signing Zlatan Ibrahimovic among the substitutes - cost a more modest £61m, but was ably bolstered by youth products Lionel Messi, Xavi, Andres Iniesta, Carles Puyol and Victor Valdes. For the first time ever they showed it in 51 cinemas across Spain, such was the appetite for this fiesta del futbol, and a global audience of one billion awaited in salivating awe. Madrid's daily sports paper AS dubbed the fixture 'Cantera contra Galacticos', as Barca's brilliant batch of homegrown stars took on the costliest team ever assembled. Having looked on from the shadows as Barca won the treble and stole the hearts of the watching world by playing some of the most beautiful, spell-binding football ever last season, Real had to prove their record-breaking outlay was not merely designed to placate their infuriated fans. By matching and then having the temerity to outplay Barca for periods on their own patch, Manuel Pellegrini's team have proved they are the real deal. And in Kaka and Ronaldo, the last two Fifa World Players of the Year, they have two players capable of destroying any team. Twice in the opening half hour they linked up at breathtaking speed to carve Barca open; first Ronaldo shot at Valdes, before Marcelo was denied by a stunning block from the irrepressible Puyol. The Barca defender, who produced two more magnificent last-ditch challenges in a heroic captain's display, admitted: "I haven't seen Real much this season but they played very well. We were made to suffer because we had to play against a great team with great players." Just as well for Barca that Puyol produced one of the performances of his life, ably supported by defensive partner Gerard Pique, who enjoyed some fine moments against the constant threat of former United team-mate Ronaldo. Everywhere you looked, the best players in the world were trying to force the issue. Dani Alves refused to stop bombing forward from right-back even after Barca were down to 10 men following the dismissal of Sergio Busquets and Xabi Alonso prompted and probed in the Real midfield as he tussled with the incomparable Xavi and Iniesta. And then there was Messi. In the beautiful city of Barcelona where inspiration emanates from every crook and crevice, the little Argentine with the wand for a left foot stands head and shoulders above the rest. He is only 5ft 6in tall and slender at that, but in a game increasingly the playground of the powerhouse he will soon receive the accolades that were bestowed upon Kaka and Ronaldo and that will tell the world what it not-so-secretly already knows - that Messi is the finest player on Earth. 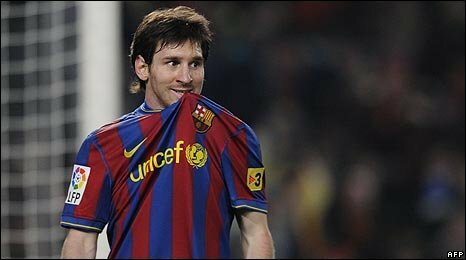 A major doubt with a thigh strain before the match, he was comfortably Barca's most dangerous weapon as he jinked this way and that, strayed menacingly infield from his starting position out on the right and linked - at times impossibly - with his red-and-blue shirted colleagues. Twice he caused gasps of astonishment from a crowd that is fortunate enough to witness his implausible talents every other week. Whisper it quietly, but some people around here reckon he might just go on and become the greatest of all time. Occasionally, Real had to resort to foul means rather than fair to stop Messi - on one occasion Alvaro Arbeloa rugby-tackled him to the ground - but for a match of such intense feeling and one that ended 10-a-side, there was little on show that characterised the 107 years of bad blood between the arch rivals. There was simply a lot of glorious football, most of it a joy to behold. Ibrahimovic will get the headlines and deservedly so - he has had more than his fair share of accusations that he goes missing in big games thrown at him, so the Swede should enjoy his moment after clinically volleying past Casillas five minutes after coming on. "Dani gave me a great cross," the smiling Swede told the press afterwards. "I just tried to hit it and it went in. It's a great moment, in my first Clasico. It was a fantastic atmosphere, I'm really happy." But Real will have left Barcelona on Sunday night not only with 98,000 supporters' whistling ringing in their ears. They know they have sent out a message that, only 212 days after being demolished 6-2 in their own stadium by Barca, their Galacticos Project Part II is working. Real's director general Jorge Valdano could barely hide his excitement, regardless of the result: "It was an intense and attractive match between two ambitious teams. "We deserved to have more luck, but the team showed enormous maturity in a difficult stadium. I think it should ease criticisms of us, as it shows the side is making progress and we have the players to compete at this level." In March, Liverpool thrashed Real 4-0 as they dumped the nine-time winners out of the Champions League. That, along with the humbling at home by treble winners Barca, was enough to trigger Real's bold response. Now, the two great enemies of Spanish football are both in fine fettle. Perhaps they have one eye on the ultimate Clasico of them all - in the Champions League final in the Bernabeu in May.